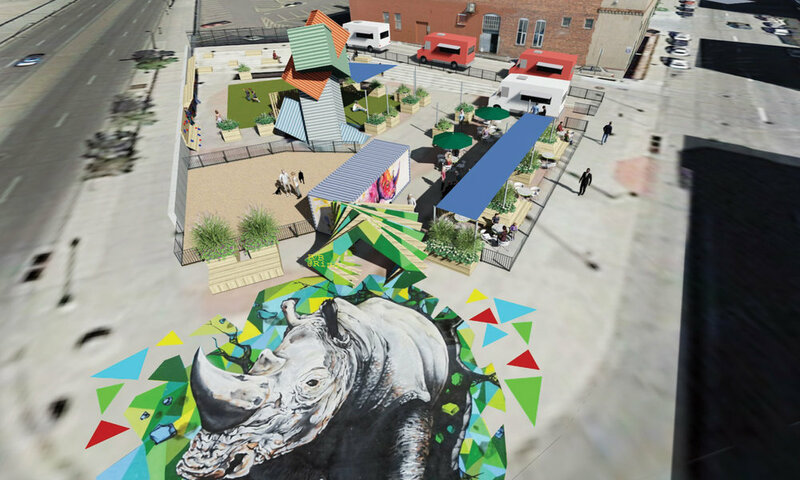 Boxyard Park will be open and free to the public through a partnership between the RiNo Art District and Denver Parks and Recreation. This unique space will be regularly activated through programing and special events and will serve as a gathering place for all. Our goal is to create an urban, energetic gathering place that brings the community together - to work, play, rest, converse and be inspired. A detailed events and activation schedule will bring life to the park, which will also be available for private events on a limited basis. The park will be kid and dog friendly and will feature a climbing wall, dog park, stage and seating areas as well as a regular rotation of food trucks. We are thoughtfully programming the park to maintain a vibrant atmosphere. In RiNo, we are redefining how to grow a place, with intention. By creating as a collective, we are setting a new standard for the advancement of this city, a new model for how communities evolve. Through the lens of art, we rewrite the rules on what governs our community, a trusted haven where each voice has a platform. Through art, experimentation thrives in business and boundaries are broken in urban revitalization. And through art, we serve as a steward of respect and preservation, honoring the rich heritage of the many neighborhoods we are a part of. Fueled by artistry in innovation, we are driven to rewrite rules and break down barriers — to establish a safe place in which to live, explore, create, and push for more. To that end RiNo is moving forward on critical initiatives that will shape the district for years to come while investing in programs to activate our community.